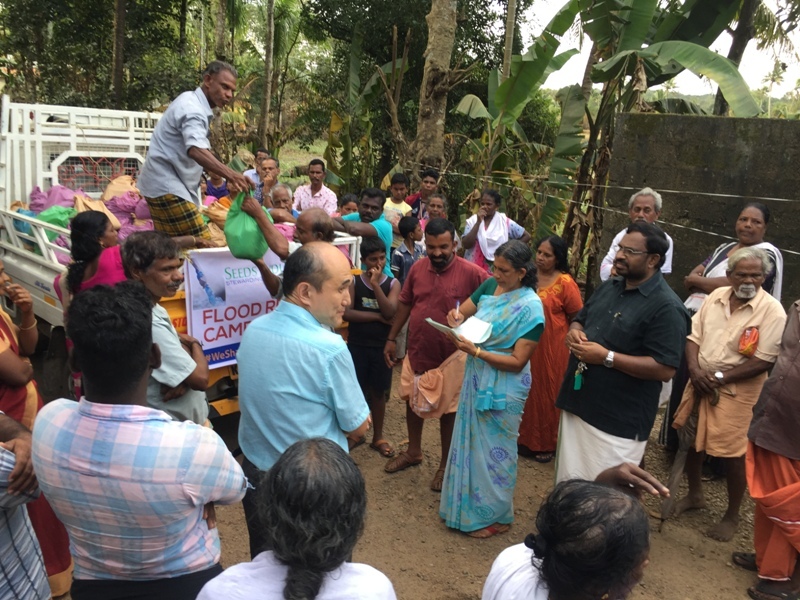 In response to Kerala Flood SEEDS India has begun a Flood Relief Campaign to help the affected in every possible ways. As an immediate post flood response SEEDS India provided 250 kits containing dried rice, Dal, beans, cooking oil, coconut, sugar, tea, potato, onion, biscuits, wheat powder etc to families who are shifted back to their homes from relief camps in flood affected villages in Pathanamthitta District. However we know that our helping hands should be reached to other severely affected areas in Kerala if possible. We have a long term plan to rehabilitate maximum affected families that including clothes, medicines, sanitary napkins, construction of toilets, renovation of homes, providing domestic animals like goat, chicken, and cow. Moreover we are planning to provide free counselling to the people who are mentally stressful. Since SEEDS India has other regular financial commitments like, daily free food distribution at government district hospital here at Kozhencherry city which has full of occupants now a days and other social services we are forced to request generous contributions from our friends, philanthropists and well-wishers to stand with our fellow-being in their life and death situation. Please send donations online or via check to the below mentioned accounts. SEEDS-India has approval of 12 A (Exempted from Tax) and 80G (Exemption from tax for Donor) but does not have the approval to accept foreign donations so in such cases we work in close coordination with IARF (Thomas Mathew is the head of that NGO also) which has FCRA approval. We’ll send the receipts to all donors in due course of time via email/post.